Mercury, the small rocky planet in our Solar System closest to the Sun, will be making a rare transit across the Sun on Monday May 9th, 2016. The transit itself will last from 7 a.m to 4 p.m EDT. However, why is it such a big deal to see a planet move across the Sun from Earth’s perspective? What does this mean for humans and science? Why the big fuss? Well I’m here to help break it down as it’s filled with a rich history that’s been on-going for hundreds of years and has progressed humankind as a result. So here’s why the 2016 Transit of Mercury is incredibly cool. A word to the wise: DO NOT view the transit without proper solar viewing equipment. You will do irreversible damage to your eyes if you look at the Sun directly. Please contact your closest science centre or observatory for viewing opportunities. It’s an incredibly rare event, but why? It’s similar to how a solar eclipse is a special event on Earth, where the Moon blocks the Sun almost perfectly, but instead you are about 500 times further away. Since Mercury is so much farther away from Earth we see it as a dot travelling across the face of the Sun from our perspective. However, this still doesn’t answer why it’s rare, so what gives? Well imagine a flat plane with the Sun in the middle and Mercury and Earth orbiting around the Sun. Now, Mercury’s orbit is inclined by 7 degrees when compared to the Earth. So what you have is an orbit that loops around in a diagonal fashion instead of a nice perfect flat orbit around the Sun. There is also something else that directly makes it harder as the inclination offset isn’t the only factor. It takes Mercury 88 days to orbit around the Sun while it takes Earth 365 days. This means Mercury is orbiting much faster around the Sun than Earth. Thus, making it tougher to view Mercury pass in front of the Sun from Earth’s perspective. This event only happens 13 or so times in a 100 years. The next time it will happen after May 9th is November 11th 2019 and November 13th 2032. There is a great story behind how we calculated the distance from the Sun to the Earth and it all starts with the transit of Mercury. 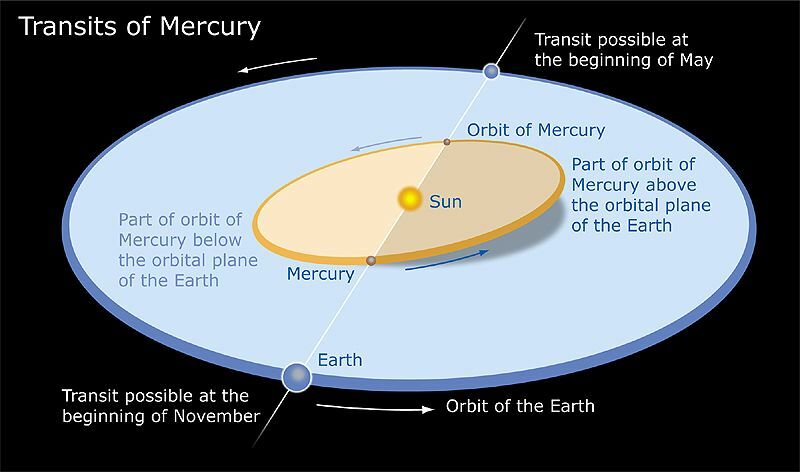 In 1677 the famous astronomer Edmond Halley observed the transit of Mercury. Not only that but he understood that if the transit was to be observed from different latitudes on Earth, thus providing different angles, that he would be able to calculate the distance from the Sun to the Earth. 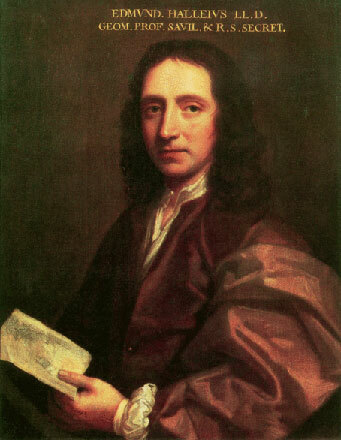 However, Halley died in 1742 and never got a chance to calculate the distance using the transit of Mercury. In 1761 and 1769 the transit of Venus occurred. During those periods scientists used Edmond’s methodology to calculate the distance from the Sun to the Earth. They discovered it was 24,000 times the Earth’s radius, only being off by 3% the real value. Not bad considering it was done in the 1700’s. Transits are used today to discover exoplanets or planets in other Solar Systems far away. Just as we see Mercury fly across the face of the Sun we also noticed a dip of brightness. 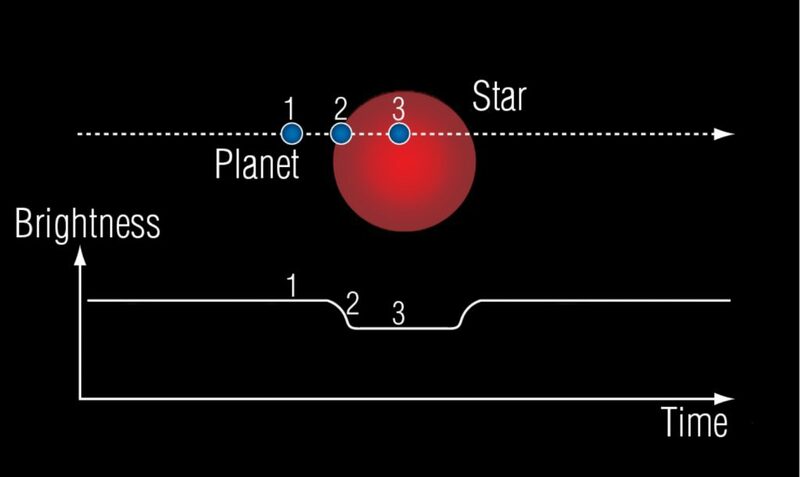 This method is used to find other planets in the same fashion. A very useful and helpful tool that has helped us discover thousands of exoplanets. If you’re interested in learning more about discovering exoplanets then I highly suggest to check out the space telescope called Kepler. 2. Mercury has ice water on the planet. Considering it’s the closest planet to the Sun it may have come as a shock to scientists to discover water on Mercury. 3. Mercury had many active volcanoes that were also very violent. 4. Mercury has an odd off-center magnetic field. Here’s what I mean. 5. We still don’t understand how Mercury formed.